To enter, send me an email before 9PM on Saturday, June 14th, with your Top 10 List of sets you think are going to retire. The person* who guesses the most correct sets will be declared the WINNER and will receive a FREE Stampin' Up! set from my stash! 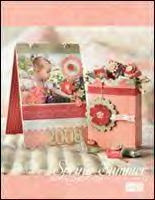 Don't have a catalog on hand....just click on this link or the picture of the catalog to view the catalog online. Be sure to check back on June 15th to view the Retired List and see if you've won!